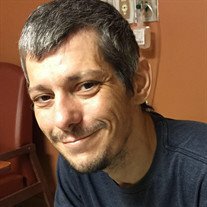 Jonathan Michael Patton, age 42, died Monday, September 3, 2018 at Erlanger Hospital in Chattanooga. He was born May 12, 1976 in Dayton. Jonathan was preceded in death by his grandfather Jack Patton. Jonathan lived in Dayton all of his life. He was a carpenter and attended the East Valley Baptist Church in Dunlap. He is survived by his wife Jessica (Seals) Patton of Dayton; his three children, Jackson Lane Patton of US Army S. Korea, Raven Patton of Dukedom and Carissa Bishop; his brother Zachary Crabtree; his sister Vanessa (Allen) Hickey; his mother Lisa Crabtree and his grandmother Wanda Patton all of Dayton. A graveside service for Jonathan will be held Saturday at 12:00 noon at Spence Cemetery in Dayton with Pastor Blake Patterson officiating. Please share your memories of Jonathan on his online guest register at www.vanderwallfh.com. The family is being cared for by the Vanderwall Funeral Home in Dayton.